A bit like a pan of stuffing packed into a quiche (not a bad thing). 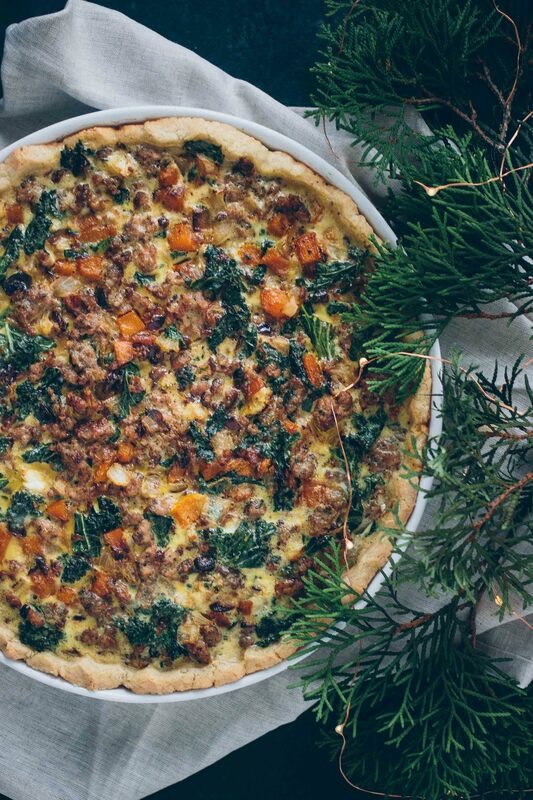 This dish is a bit like a pan of stuffing packed into a quiche. The combo of hearty veggies in this filling is one of my favorites. It gives the gives a very winter-y feel. To have it for your Christmas morning (or other celebratory morning) breakfast, you can do a lot of the prep the night before. Prepare the crust, cover, and keep it in the fridge until filling the next morning. Prepare the sausage and veggies filling and stick them in a covered dish in the fridge. As well as mixing up the egg mixture and storing that separately. Then you can fill the quiche accordingly and stick it in the oven in the morning just before serving. It may need a couple of extra minutes in the oven since the filling will be cold. I recommend a deeper quiche pan for this guy due to the bulk of the filling ingredients. An 8″ or 9″ deep pie pan, springform, or other similar pan will work well. I used a shallow, but wide, dish so a 9×13 baking dish would likely work too. Just keep in mind that the deeper the pan, the more you’ll want to ere on the side of the longer cook time. *To prepare the crust: stir the gelatin into 4 tablespoons of the filtered water in a small bowl. Set it aside for 3-5 minutes to bloom. Add the almond flour, cassava flour, and sea salt to the bowl of a large food processor. Process briefly to combine. Add the bloomed gelatin and process again until the gelatin is well incorporated and there are no chunks visible. Add the butter and pulse until the mixture is crumbly and the texture resembles small pea-shaped balls. With the food processor running, drizzle the remaining water into the dough one tablespoon at a time until the dough begins to form a ball (the amount of water needed may differ depending on the humidity in your area). The dough should be soft and slightly moist, but not damp. Dump the dough out into a 9″ quiche pan or baking dish and press into the bottom and up the sides, crimping the edges, as desired (my pan is 12″ so I pressed out a slightly thinner layer). Move the crust to the refrigerator to chill for a minimum 30 minutes before filling. *To prepare the filling: add the sausage to a wide skillet over medium-high heat. Cook until brown and crumbled, about 10 minutes. Remove the cooked sausage with a slotted spoon and reserve for later. Add the butternut squash to the pan with the reserved sausage grease. Cook until it begins to soften, about 5 minutes. Add the cauliflower florets and cook another 5 minutes, stirring occasionally. Add the chopped onion and continue to cook until everything begins to brown, about 10 more minutes. If the bottom of the pan starts to look dry, drizzle in a bit of your favorite cooking oil. Add the kale to the pan and cook until the greens have wilted. Add the sage, thyme, and chopped cranberries and stir. Add the reserved sausage and turn the heat off. Whisk together the eggs, coconut milk, nutmeg, sea salt, and black pepper in a large measuring cup or bowl with a spout. Fill the quiche by pouring the sausage and veggies into the chilled crust (work quickly so it doesn’t get too warm). Spread the ingredients out to form an even layer. Pour the whisked egg mixture in and around the filling. Cook for 25-30 minutes, or until the egg is set up and the edges of the crust begin to brown. Allow the quiche to rest for 10 minutes before slicing and serving.